Brothers Bob and Steve Negen loved flying kites, so in 1981 they decided to try making a living selling them. 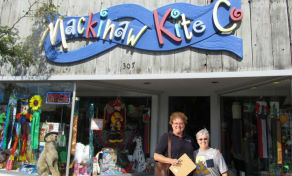 They opened a small kite shop in Mackinaw City, Michigan, and came up with the brilliantly imaginative name "Mackinaw Kite Co." Although young and inexperienced (Steve wasn't even 20 yet), their enthusiasm and passion for their product sold enough kites to pay the rent. 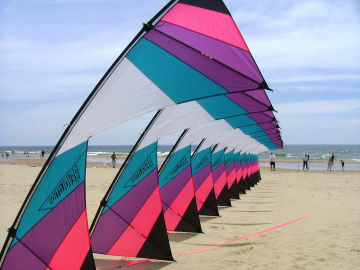 Wanting also to pay their salaries, the two added related products like windsocks to their already colorful selection of single line kites and stunt kites. 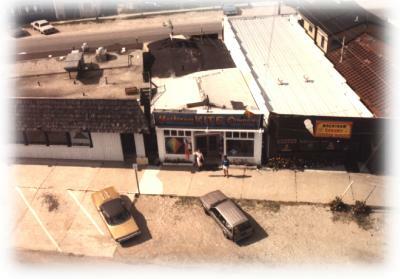 By 1986, Mackinaw Kite Co. was doing well enough to add a second location in Grand Haven's Chinook Pier shopping center. Thanks to a perfect kiteflying beach nearby, this store also sold enough kites to pay the rent plus a small salary, but winter foot traffic was non-existent. 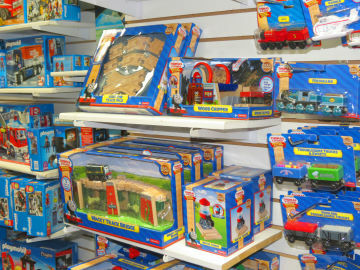 Needing to eat year-round, in 1991 Bob and Steve moved their new shop to a space in Grand Haven's downtown and added classic toys such as wooden trains, yo-yos, and other hands-on, educational toys, puzzles, and games. 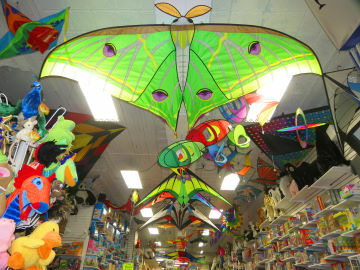 In 1997 they moved the store a few doors down into its own building, making it not only one of the world's oldest kite shops, but one of the largest as well. The company was expanding in other ways, too. 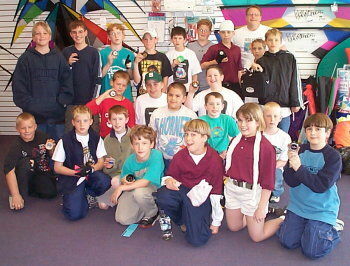 If you lived near Grand Rapids, Lansing, Jackson, Detroit, Ann Arbor, Bay City, Toledo, Cleveland, or Fort Wayne in the second half of the nineties and had a yo-yo pro visit your school, chances are it was one from Mackinaw Kite (also known then as Yo-Yo Universe). Kids interested in improving their yo-yo skills could visit any of over a dozen Yo-Yo Universe locations and attend free yo-yo classes and earn prizes each time they gained a skill level. 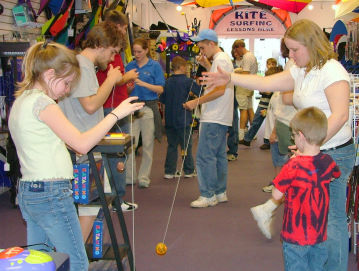 Mackinaw Kite Co. also sponsored several yo-yo contests, with some contestants even going on to compete at the national level. 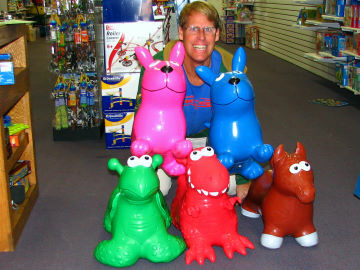 When the yo-yo craze had finally run its course in mid-1999, Bob, now with a wealth of experience in retail, decided to start a new business sharing what he'd learned with other retail shop owners. 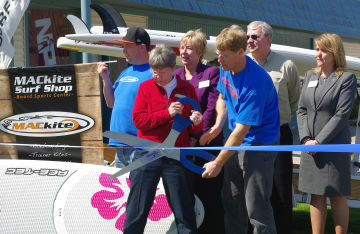 Steve, joined by his wife Lynn, remained to lead Mackinaw Kite Co. and soon expanded the product offering once again to include kiteboarding gear, Stand Up Paddleboards (SUP), and surf shop apparel. 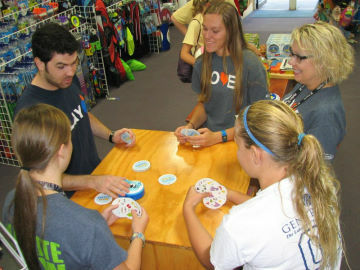 Excited by the opportunity to bring hands-on fun to customers from around the world, he also grew the shop's online selection from just yo-yos to kites, toys, games, kiteboarding gear, SUPs... a little bit of everything you could find in the physical store could also be found on the web. Wanting to spend more time with his family, in 2009 Steve decided to focus his energy on the Grand Haven and web stores and sold the Mackinaw City location to Lisbet, his very capable manager there, changing the name of the Grand Haven location to MACkite. 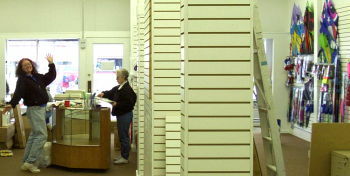 Although separate businesses, the two "sister stores" maintained warm ties. In the fall of 2017, Lisbet retired and the Mackinaw City store closed after 36 years of fun. 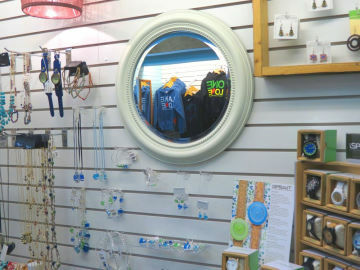 Today MACkite is a major destination in Grand Haven's historic downtown. (Don't believe us? Take a look at anyone holding one or more shopping bags as they browse the local shops- more often than not, at least one says "MACkite"!) 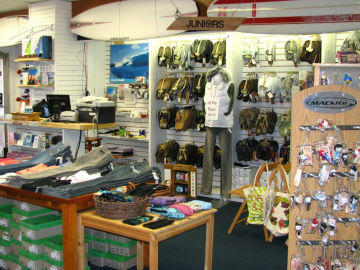 Having expanded to nearly twice the size it was in 1997, one side of the shop is dedicated to surf fashion, accessories, and boards, while the original half has the biggest selection of kites, games, toys, and wind decor it has ever had. Customers who have been shopping at MACkite for years often comment on how they are always able to find something new and fun each time they visit- and how the staff is always ready to play the latest games with them! Originally taking up just a back corner of the MACkite Surf Shop, the kiteboarding and SUP department grew until it had nearly taken over the entire surf side of the store. In 2012, it moved into its own building with a showroom and small warehouse in Grand Haven's Eastown. Now with room to grow, more boardsports were added, like surfboarding, snowboarding, and skate. But by the end of 2015 the Boardsports Center was out of room again and moved just a couple miles to the south. 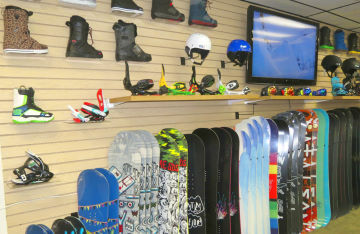 With a larger showroom and warehouse, MACkite added skiing and electric bikes to its selection of outdoor fun. 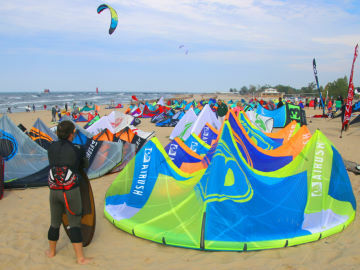 The King of the Great Lakes Test Fest, held each fall, is a popular event for kiteboarders who want a hands-on look at next year's upcoming gear. It has, over the years, been both a competition and a friendly gathering of boardsport enthusiasts. 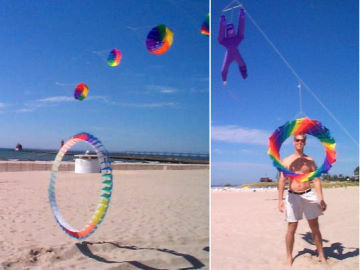 The first one, in 2001, was a gathering of a few local kiteboarders to demonstrate the new sport to curious onlookers. As kiteboarding gained popularity and riders gained skill, the event was able to grow first into an informal "best trick" and "biggest air" contest, and then into a nationally recognized competition, drawing some of the nation's best riders. In 2009 the event saw the Midwest's first ever course racing competition. Each year KoGL introduces more people to the thrill of surfing across the water behind a powerful kite. 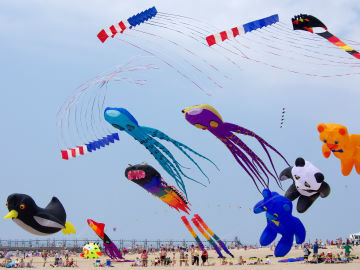 The Great Lakes Kite Festival evolved from its roots as the Great Lakes Sport Kite Championships in 1989 to one of Grand Haven's largest festivals, second only to the Coast Guard Festival. 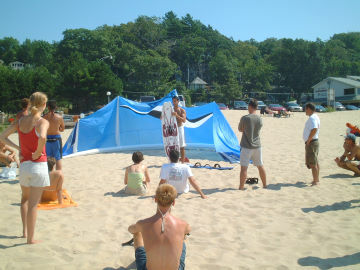 Each May, on the weekend before Memorial Weekend, kiteflyers and spectators attended from all over the nation and world, often making camping and lodging reservations months in advance in order to secure a spot on or near the beach. After 30 years of kicking off summer a week early, MACkite retired GLKF with a Grand Finale event in 2018. The Reeds Lake Ice Fly, held yearly in late January or early February, also started as a competition back in 1995. 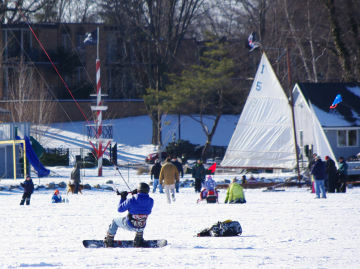 Kiteflyers on skis or skates joined ice boats to see who could cross the lake the fastest. Later it became a fun gathering of kiteflyers of all types. 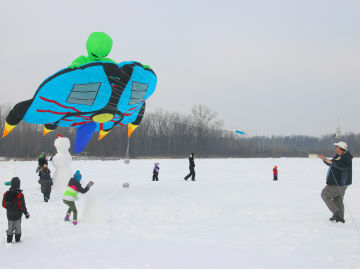 You could see children flying small kites they'd just made, stunt kite flyers, serious kiteflyers with kites as large as school buses, and even snowkiters on snowboards, who reminded us of the event's roots in racing across the ice. But with low wind and uncertain ice conditions many of the event's years, the annual Reeds Lake Ice Fly finally ended after its 21st year in 2015. MACkite continues to enjoy success in a world flooded by electronic entertainment options because of its commitment to old and new alternatives which don't need batteries or electricity, and many of which encourage folks to get outside and get active. MACkite's product line may have evolved quite a bit from its roots as a kite shop, but it has remained true to the motto and company philosophy that Bob and Steve coined back in 1981: to be "Where FUN Begins!™"